…skin and although I sometimes fantasize about a total skin renewal, this post is about snakes. 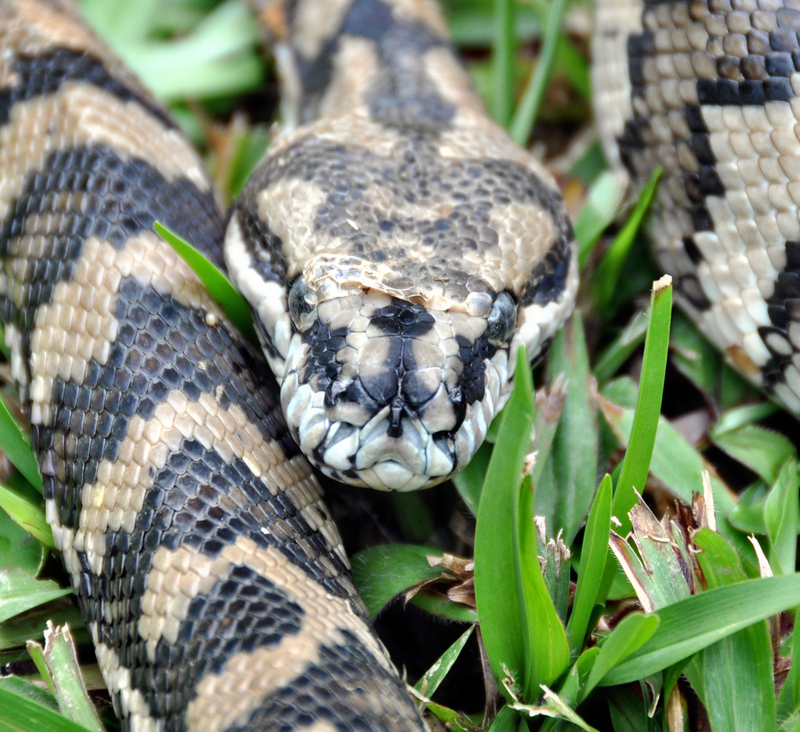 I’ve written about Carpet Pythons in a previous post ‘Keeping Warm’ but this particular Carpet Python (Morelia spilota), resting on some mown grass near one of our ponds, was just starting to slough its old skin. It is a fascinating process and while we often come across snake skins on rafters in the shed (they provide some roughness which assists in the sloughing), we don’t often have a chance to observe the start and compare old with new. 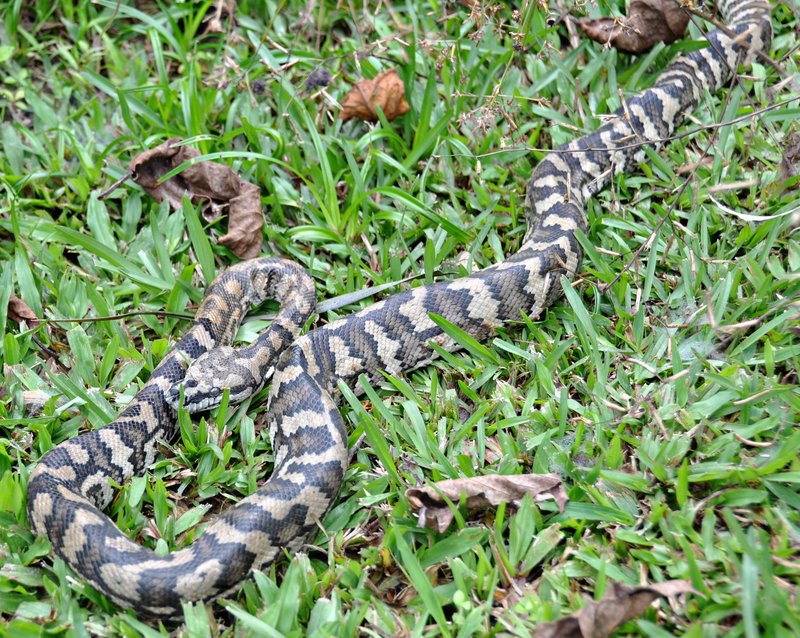 The first photo gives an overall impression – the snake was close to 2m – resting on the grass in some sun while it digested its most recent meal. while the close-up of the head shows the old skin starting to peel back revealing the fresh new skin underneath….quite a dramatic renewal process. The milky appearance of the eyes is due to an oil which is produced beneath the lid to aid the lifting of the skin. From the side of the head a nostril is visible in a black streak, slanting slightly backwards. Morelia spilota have heat sensory pits but I am unable to identify them. Usually found in the lower jaw they may not be visible in these photos. 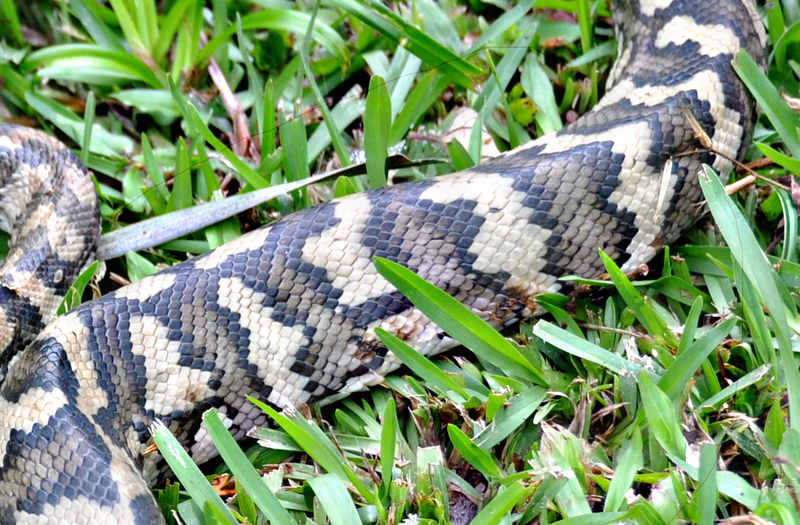 UPDATE – this morning when Allen was mowing he found the same Carpet Snake in almost the same position, waiting for the morning sun. I managed to get a better photo of the lower jaw which does show 5 to 6 heat-sensory pits which enable the snake to locate warm-blooded prey. Notice that the eye is looking much milkier than a few days ago, the snake still has most of its old skin although it is looking broken in parts. Our friend Rupert thinks it may have a problem as it should have shed by now – the sun was shining today so perhaps it has been able to increase its metabolism enough to slough it off. We’ll look again tomorrow and hope all is well as I’m not sure how to help a snake out of its old skin! 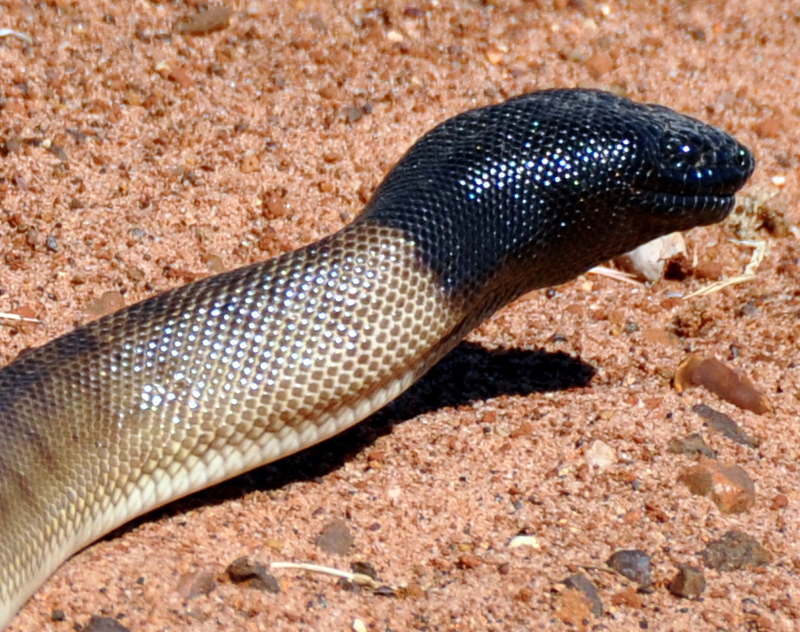 The Black-headed Python (Aspidites melanocephalus) is one of two Australian species in this genus and it is found mainly in the seasonally dry areas of the north. 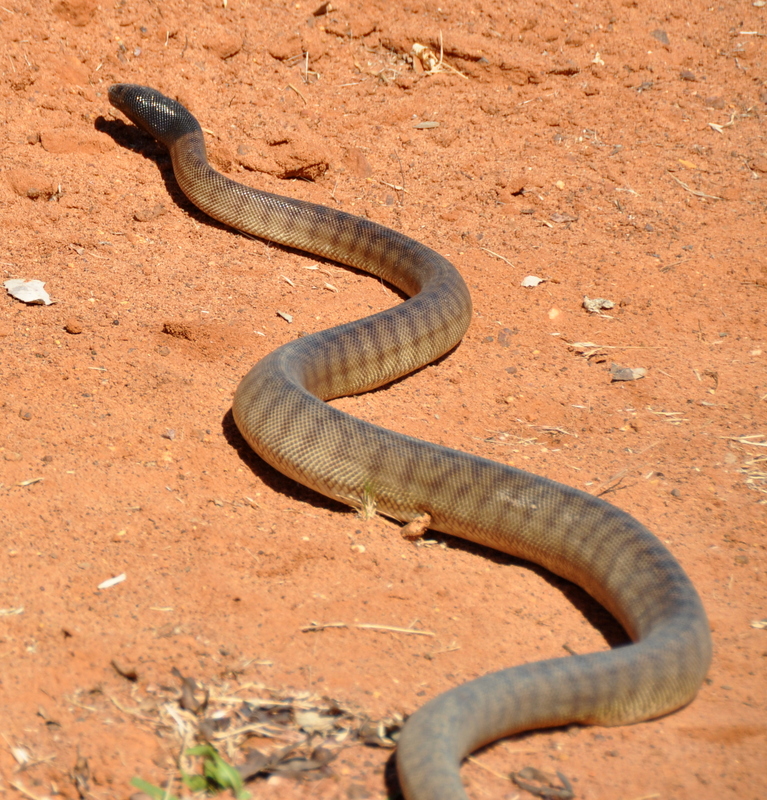 This specimen was photographed on the road between the Lawn Hill Miyumba Bush Camp and Camooweal. Its narrow head is not obviously distinct from the neck and it is thought this more streamlined shape may be an adaptation to their ground dwelling lifestyle. These terrestrial pythons shelter in hollow logs, crevices in rocks or in the ground and mainly hunt other reptiles. Unlike most other Pythons they do not possess heat-sensory pits, which are not needed as they mainly prey on other cold-blooded animals. They are most attractive snakes and one of the creatures I had been hoping to meet on our recent trip – we actually saw two and on both occasions waited until they were safely off the road. 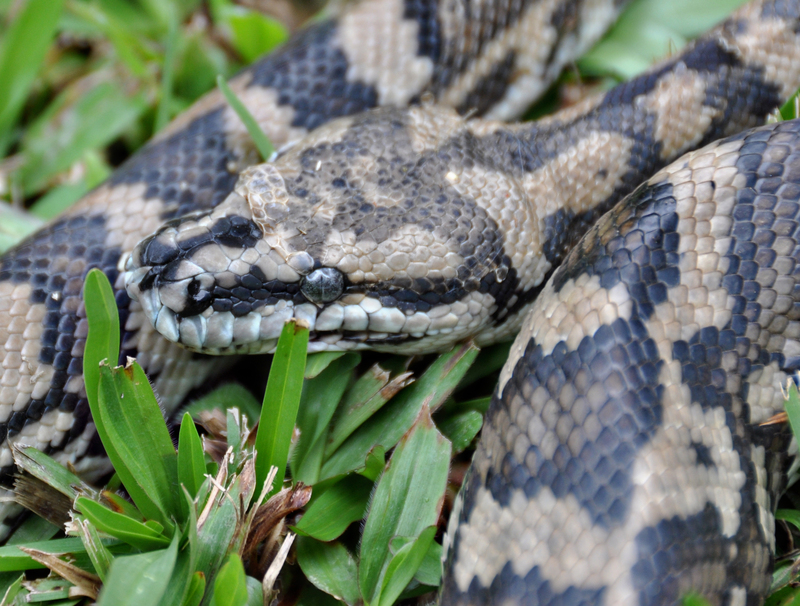 This entry was posted in Reptiles and tagged Aspidites melanocephalus, Black-headed Python, Carpet snake, Morelia spilota. Bookmark the permalink. Fascinating photos. BUT I am glad I am just looking at the photos! Yes I wondered what your reaction would be – they are truly fascinating Mick!